Mounted on a striped round base, the detailed Karaoke King Microphone Award features a lifelike microphone sitting on a silver stand. Cast from a superior grade resin the microphone is finished in a sparkling gold with black detailing and has been varnished to create a glossy sheen. This stunning award features a replica microphone finished in gold and mounted on a round base. 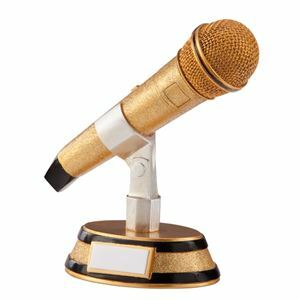 The Karaoke King Microphone Award is made from a premium grade resin and come with a FREE self adhesive engraved text plate.